Nepal's government has raised the official death toll from the country's 10-year civil war by more than 3,000, officials say. The revised death toll records at least 16,278 deaths during the conflict. The previous estimate was about 13,000. The toll was raised after more people in villages registered the deaths of relatives during the conflict. 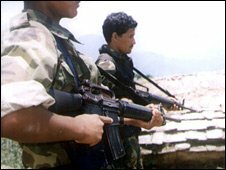 The war between Maoist rebels and the government came to an end in 2006. The Maoists later won a general election. But some 19,000 Maoist former combatants are currently living in UN-supervised camps throughout the country. Disagreements over what to do with them led to the resignation of the Maoist government in May.